The first student to attend the University of Pennsylvania from Latin America seems to be a Cuban named Joseph M. Urquiola, a graduate of the Medical School class of 1829. Three other Cubans would graduate in the in the next two decades, as well as one Venezuelan, Auxencio Maria Pena who would also graduate from the Medical School in 1836. In the early twentieth century, three honorary degrees were given to Latin Americans – one in 1900 to the President of Mexico, Porfirio Diaz, one in 1906 to Ramon Ibarrole, then the Chief of the Hydrographic Commission of the United States of Mexico and another to Julio Prestes in 1930, who was then the President-elect of Brazil. 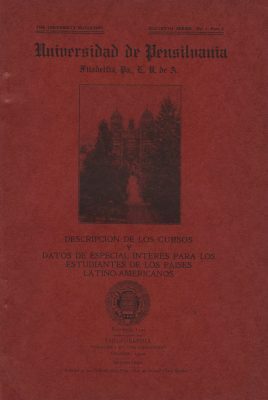 In 1910, University Recorder George Nitzsche published what was essentially a course catalogue in Spanish (another one appeared in Chinese), and from 1910 to 1912, approximately 10,000 circulated in Latin America (view the entire 1910 catalog). Although expressing to those potential students in Latin America the benefits of coming to the University of Pennsylvania, one is unsure if the effort paid off. It probably did at the time of publication, but there was also a decline in the number of Latin American students attending Penn over the next two decades. In 1910, there had been eighty-five Latin American students registered for courses. In 1920, though, there were fifty-seven and by 1930, there were thirty-seven. Obviously, something had to be done to attract more Latin American students to the Penn campus. But whatever they decided to do, would it succeed? And why had the number of Latin American students on campus declined so much? An attempt to answer these questions is a little further on in this report, but chronologically, even though the Latin American student population at Penn was declining, Penn’s interest in Latin America was not. 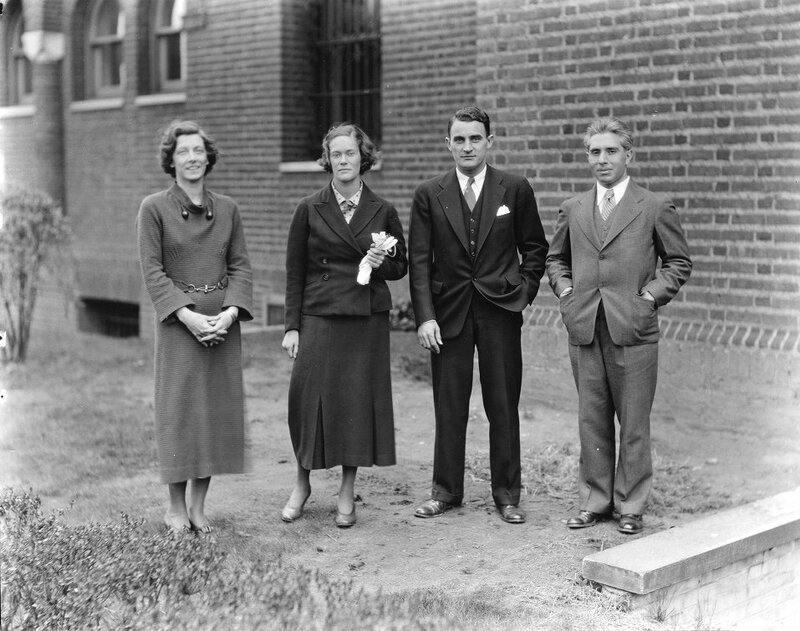 The 1930s and 1940s were exciting years for expeditions that were made by Penn faculty and staff to Latin America. Expeditions in Latin America were not unusual; in fact, the first had been in 1896, led by Dr. Max Uhle under the William Pepper Peruvian Expeditions. University Museum archaeological expedition to Guatemala, headed by Eldridge R. Johnson, second season of work (1932). At any rate, in June 1930, the University of Pennsylvania gained permission from the Guatemalan government to conduct an excavation of Piedras Negras. In the times of the Mayan Empire, this location was a city – Penn would be allowed to examine its ruins. The expedition team was led by Eldridge R. Johnson, and its field director was Dr. J. Alden Mason. The Penn team found many artifacts there. Pictures were taken of the team’s camp (shown at right), as well as some of their findings, including a ceremonial altar, a temple and a stela (a slab of stone that would be carved or inscribed). The University Museum’s expedition to Guatemala that season was very beneficial, and they continued to send teams. Three summers later, in July 1933, there was a University Museum expedition led by Mr. Vincenzo Petrullo, then the field director for South American research, to Venezuela. He was examine what opportunities could be found there for archaeological work. University Museum representatives before leaving on joint ethnological expedition to Venezuela. An expedition to Piedras Negras was led by Linton Satterthwaite, Jr. in 1935, making it the fifth expedition there. Two months after Satterthwaite left, it was decided that Petrullo would lead a return expedition team (pictured at left) to Venezuela and would join efforts with Columbia University to investigate the Goajiros, a tribe of semi-nomadic American aborigines. Sponsored by the Latin-American institute, the Goajiros project was extremely beneficial not only to the studies of anthropology and archaeology, etc., but also to the governments of both Venezuela and Colombia, which both owned portions of the Goajira peninsula. 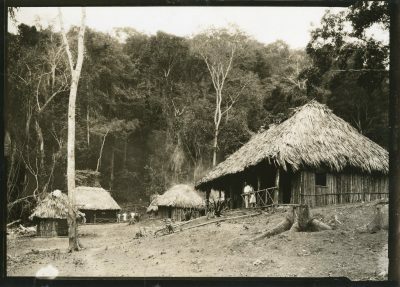 In June 1940, the University Museum displayed “[o]ne of the largest collections of gold objects ever found by archaeologists in the western hemisphere… The ornaments… are the results of a recent expedition from the Museum to western Panama.” That expedition had been made with the full knowledge of the Government of Panama, but it had been conducted on privately owned land in Cocle. Some artifacts were also presented, though, by the National Museum of Panama that same year. Returning to the subject of foreign students, in July 1941, Penn President Thomas S. Gates presented to the Argentine Consul in Philadelphia, Dr. Ernesto C. Uriburu, a trophy (pictured at right). Engraved and silver, it was to be used as the prize for the annual soccer competition which had been held between educational institutions in Argentina. Gates declared that it would “serve as an expression of mutual esteem between the halls of learning in Philadelphia, and those in Argentina.” Mere weeks after this event, some educators from Latin-American nations came to Penn had lunch at the Pan-American Association, where they were greeted by Gates. A large undertaking occurred in the winter of 1941-1942, when over thirty Colombian students studied at Penn. Taking courses in the winter, beginning in December, the students eventually earned certificates as Visiting Fellows of the University. The Institute of International Education sponsored the visit, which worked with the coordinator of Inter-American Affairs in Washington. The whole program was designed to promote more mutual understanding between Latin America and the United States. 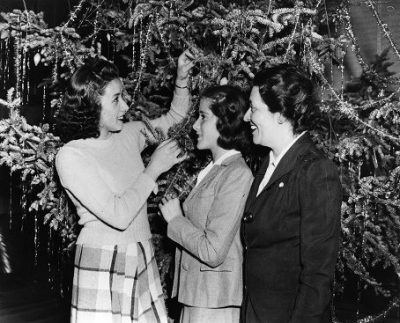 Visiting even through the holidays (pictured at left), the program succeeded. One of the medical students of the group, Marco Hernandez stated, “[w]hen we came here, we had only curiosity about the American people. 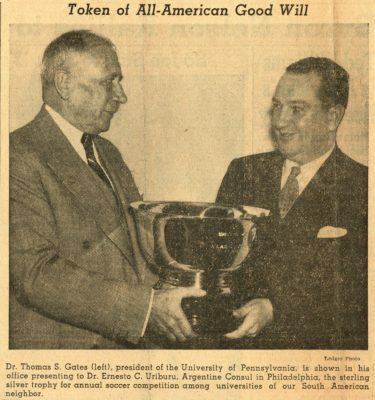 Now we love them.” This was followed in March, 1942 Penn President Gates greeting ten Chilean physicians to tour the Penn campus. The physicians were members of the National Bureau of Workers’ Security in Chile. Later that spring a Penn student, Thomas Boylan, Jr. became a finalist in the National Contest on Inter-American Affairs. That summer, those who worked in the Inter-American field were able to train at the University of Pennsylvania (cover of brochure at right). 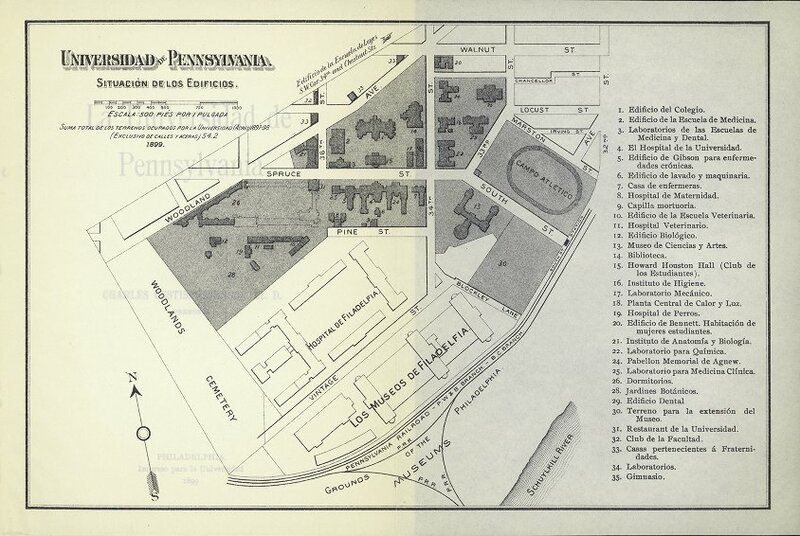 Announced by Penn President Gates, the “center is the only one of its kind outside of Washington and is intended for the benefit of men and women who expect to work in Latin America or who have business or professional interests in this country which may enable them to promote better Hemisphere relations.” Dr. William Rex Crawford, spoken about earlier in this report (he later became the first Director of the Office for Foreign Students), directed this program at Penn. However, despite all the efforts of the University of Pennsylvania in the early 1940s to attract more foreign students to its doors, it did not succeed. The University of Pennsylvania did not blame itself, and it does not seem that it had any reason to do so. Examining the numbers of Latin American students registered for courses, the total in 1938 had been seventeen, and in the 1941-1942 academic year, it had dropped to fourteen. Remember in 1910 that it had been eighty-five. Why had the decline continued? The reason given was that it was not the fault of the University of Pennsylvania. Since World War I, it was argued that the currency had depreciated in Latin America and schools there had improved, etc., and that accounted for the small numbers. However, the University seemed relieved when it was stated in 1946 that of all the foreign students who had attended Penn from 1880 to 1930, about 33% had arrived from Latin America. As before, this did not mean, though, that Penn’s interest in Latin America had declined one bit. The University of Pennsylvania was listed as having participated in the Havana University Summer School Sign Seminar, designed, once again, the aid the American hemispheric relations, in 1943. The Chairman of the Committee on the Study of Teaching Materials on Inter-American Subjects in Washington, D.C. was Arthur P. Whitaker, one of the men who worked closely with William Rex Crawford to establish the Office of Inter-American Studies, the predecessor to the Office for Foreign Students. The report written by Whitaker’s Committee was entitled “Latin America in School and College Teaching Materials” and was printed by the American Council on Education. In April 1944, more than a hundred students came to Penn from institutions all in the Philadelphia area to discuss topics on South America. The conclusion of the conference was that schools in South America were beginning to follow American methods of education, rather than European ones. 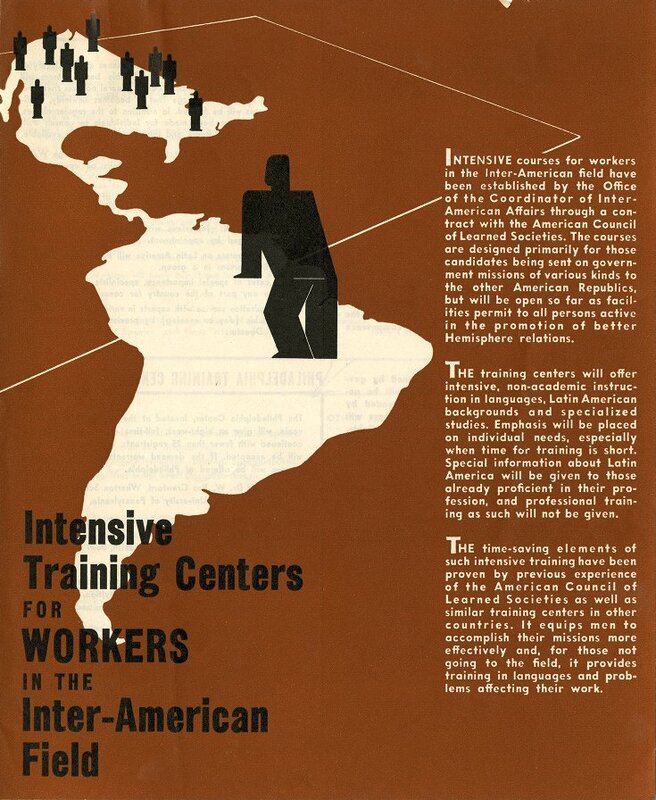 Another conference was scheduled for November 16-17, 1944 on Inter-American Culture and its racial origins. In March 1945, methods in teaching used in the field of engineering were observed by six Brazilian educators, sent by the Government of Brazil and major industrialists there. Again, Penn President Gates greeted them and they had a luncheon in Houston Hall. The next month, Pan-American week was celebrated at the campus, and there was a Fiesta in Irvine Auditorium. The Penn student body selected a Miss Pan-America who would preside over the fiesta. 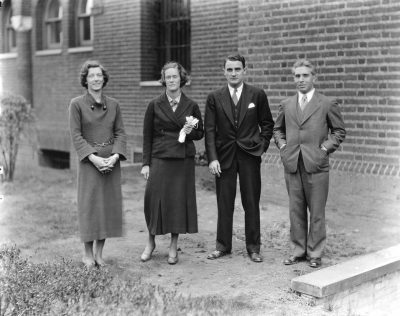 In 1947, twelve teachers from Latin America spent six weeks at Penn, and then went on to study six more weeks at other American institutions. The director of this effort was, once again, Dr. William Rex Crawford. The purpose of these events were “to promote world peace through cultural understanding.” It seems that Penn’s relations with Latin America were not so much impacted by World War II. This can only lead to the conclusion, one believes, that perhaps there is the most information on these relations during the period of the second World War, if only for the reason that so many of the other countries Penn had relations with in the past, were tragically engaged in bloody conflict. In 1950, Dr. Linton Satterthwaite, who had become associate curator of American section of the Museum after having earlier led an expedition to Piedras Negras, uncovered parts of a palace wall in British Honduras. Having met with the British district commissioner at El Cayo, Mr. A. Hamilton Anderson, they recommended to the Honduran government to make the area he had been working in an archaeological reserve of six square miles. 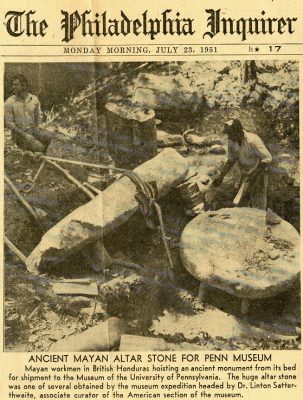 Apparently, this made the site the “most important ancient Maya architectural center thus discovered in British Honduras.” A lot of discoveries in British Honduras came back to Penn when fifteen tons of limestone monuments were shipped (pictured at left) through Belize and New Orleans to Philadelphia. As of that point in time, Penn had the biggest collection of Mayan archaeological monuments. Teams from Penn and Harvard University excavated sites in Guatemala in the early 1970s, and an exhibit in 1972 which came to be known as “Caribbean Splendors” featured pieces from Puerto Rico, the Dominican Republic, Haiti, the Lesser Antilles, Cuba and other coastal cultures. The exhibit was put together by Elizabeth K. Easby and Dr. Alfred Kidder II and was for the benefit of persons of Spanish heritage in the City of Philadelphia. In the early 1980s, the Tinker Foundation of the University of Pennsylvania sponsored a series of lectures on Latin America. Dr. Robert Kaufman, a professor from Rutgers University, spoke at the McNeil Building on “Authoritarianism and Liberalization in the Southern Cone” in late November 1980. In December 1980, Anthony Seeger, the Chairman of the department of anthropology at the National Museum in Rio de Janeiro spoke at a colloquium. Apparently, “[t]he lecture program [was] designed to bring a wide variety of scholars to Penn and to provide a focus for Latin Americanists in and around the University.” If this is the case, Penn had already succeeded at this goal, throughout their history of relations with Latin America in the twentieth century.